Long acknowledged as a master of nightmarish visions, H.P. 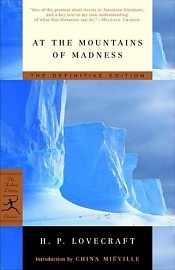 Lovecraft established the genuineness and dignity of his own pioneering fiction in 1931 with his quintessential work of supernatural horror, At the Mountains of Madness. The deliberately told and increasingly chilling recollection of an Antarctic expedition’s uncanny discoveries—and its encounter with untold menace in the ruins of a lost civilization—is a milestone of macabre literature. This exclusive new edition presents Lovecraft’s masterpiece in fully restored form, and includes his acclaimed scholarly essay “Supernatural Horror in Literature.” This is essential reading for every devotee of classic terror. H.P. Lovecraft is one of the seminal horror authors of the twentieth century. He wrote more than one hundred stories and achieved popular acclaim in such publications as Astounding Stories and Weird Tales. After he died in 1937, the small press publisher Arkham House was established in 1939 to preserve Lovecraft’s works for future generations. At the Mountains of Madness: The Definitive Edition. Introduction by China Miéville. New York, NY: The Modern Library; 2005; ISBN 0-8129-7441-7 (paperback). This book may be purchased in paperback from Amazon.com or Barnes & Noble or directly from the publisher, The Modern Library.